Join us from 5:30-7:30 pm for a screening of Sanjay Rawal’s Food Chains, 2014, presented with a talk by Dr. Ann López of the Center for Farmworker Families. This event is part of EXTRACTION, a research program exploring the industrial operations which abuse natural resources and thrive off of labor exploitation and racialized impoverishment. This event is supported by Digital Arts & New Media. It is FREE and open to the public. Metered parking is available in the Performing Arts lot. Food Chains explores the human cost in our food supply and the complicity of large buyers of produce like fast food and supermarkets. 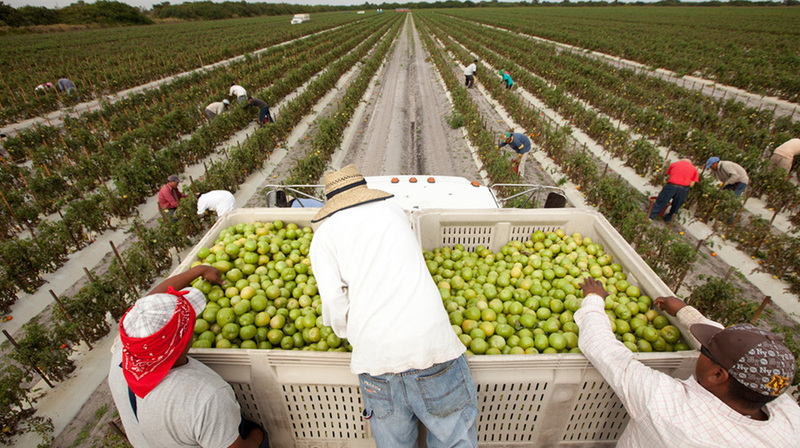 The narrative of the film focuses on an intrepid group of tomato pickers from Southern Florida – the Coalition of Immokalee Workers or CIW – who are revolutionizing farm labor. Food Chains premiered at the 2014 Berlin Film Festival and screened subsequently at the Tribeca Film Festival and Guadalajara Film Festival.